Congressional negotiators reached an agreement to prevent a government shutdown and finance construction of new barriers along the U.S.-Mexico border, overcoming a late-stage hang-up over immigration enforcement issues that had threatened to scuttle the talks. Republicans tentatively agreed Monday night, Feb. 11, to less money for President Donald Trump’s border wall than the White House’s $5.7 billion wish list, settling for a figure of nearly $1.4 billion, according to congressional aides. The funding measure is through the fiscal year, which ends on Sept. 30. The agreement means 55 miles of new fencing—constructed through existing designs such as metal slats instead of a concrete wall—but less than the 215 miles the White House demanded in December. The fencing would be built in the Rio Grande Valley in Texas. It closely mirrors Trump’s original budget request from last winter. “Our staffs are just working out the details,” said House Appropriations Committee Chairwoman Nita Lowey, D-N.Y. She said the huge measure—which combines seven spending bills into one—would be publicly released as early as Tuesday afternoon. 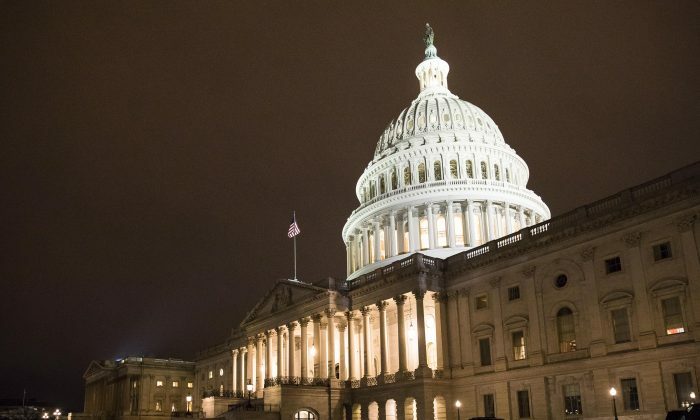 Congress needs to reach an agreement by Saturday, Feb. 16, that has enough funding to go toward the construction of a U.S.-Mexico border wall in order to win President Donald Trump’s signature and avoid another looming partial government shutdown. After prolonged gridlock over the issue that already resulted in the longest government shutdown in American history of 35 days over the holiday period, the committee members announced their commitment to ensuring that the government is funded but said that the details would not be officially released until Tuesday. The agreement also includes increases for new technologies such as advanced screening at border entry points, humanitarian aid, and additional customs officers. The agreement indicates that Democrats in the negotiations have backtracked on a Feb. 10 demand to limit funding for Immigration and Customs Enforcement (ICE) detention beds. But this was met with outrage from ICE. The department’s deputy director, Matthew Albence, said that the proposal by congressional Democrats would restrict the number of beds the agency is allowed to use for detaining illegal aliens before deportation. Albence stressed that, in effect, the policy would mean “ICE is being asked to ignore the very laws that Congress has already passed” and that those illegal aliens would go back to being released into the community after their sentencing had finished. That would be “extremely damaging for the public safety of this country,” Albence said. Currently, the agency holds a daily average of 49,000 detainees. The Democrat proposal, which they dropped in the Monday round of talks, would have capped the number of detainees at 16,500. A congressional aide told The Hill that the agreement included detention beds for 40,520 detainees, while Trump was requesting 52,000. According to ICE figures, 66 percent of the nearly 159,000 illegal aliens detained last year had criminal records. In 2016 under President Barack Obama, around 110,000 illegal aliens were detained and 86 percent had criminal records. The most common criminal convictions among illegal aliens were from driving while intoxicated, drugs, previous immigration convictions, and traffic offenses. Some had convictions for violent crimes. Meanwhile, Trump traveled to El Paso, Texas, for a campaign-style rally Monday night focused on immigration and border issues. According to Trump, the El Paso County Coliseum was filled to the brim with the help of the local fire department, while a crowd of tens of thousands watched outside in the overflow area. Trump made remarks from North Korea to the Green New Deal proposal, and from abortion to his health care reforms with the passing of the Right to Try bill. “Unfortunately, many of the Democrats in Congress responded to my call for bipartisan cooperation by instead choosing radical resistance, it’s the radical left but maybe it will change. It all has to do with 2020 and the election, but I really don’t like their policy of taking away your car, of taking away your airplane flights, of let’s hop a train to California, of you’re not allowed to own cows anymore … a lot of problems,” he continued.